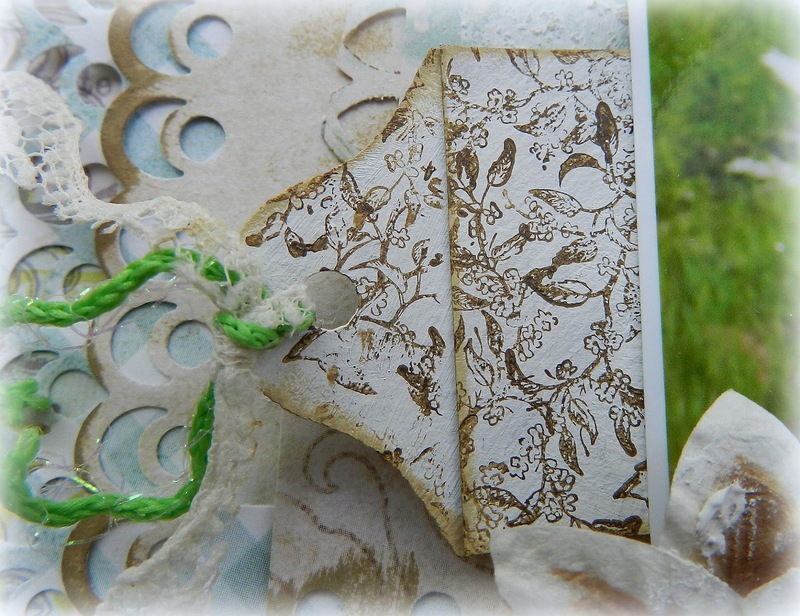 Erin Blegen: My Scrap Cabin: Scrap FX July Reveal #1 + GIVEAWAY!! I applied the stencil not only to the upper left and lower right-hand corners of my layout, but also to the central circle of the page. For the bit of brown masking in the corners, I simply laid the stencil down and dabbed over it with a brown chalk fluid edger pad. For the masking over the circle, I placed the stencil over 1/4 of the circle , finding the center and making a little mark so when I did the remaining 3/4, I could easily line up the pointed end of the stencil. I took a paintbrush and dabbed on texture paste over the stencil, dried it with my heat gun, and then used the same brown chalk pad to add just a hint of color. I still wanted to retain the light blue shade of the paper beneath, so I was careful to keep the coloring to a minimum. After my foundation was complete, I was able to place my photos and begin clustering! 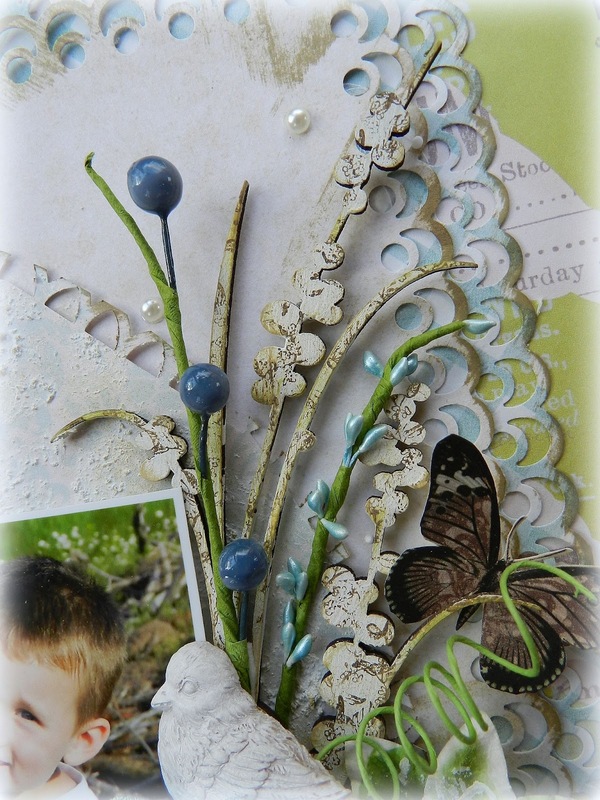 I started my cluster at the right-hand side of my layout with this beautiful new “Berries Stem”. I painted it first with gesso before applying a tan shade of chalk ink, dabbed the edges with a darker shade yet to add some definition before finally taking a dark brown chalk ink and stamping over it with a vine stamp. This stem was the perfect addition to this cluster, along with the other twigs and sprigs . There’s nothing like a beautiful flourish to set the stage for a cluster. The “Flourish V” one is particularly beautiful. I treated it the same as I did the “Berries Stem” and the rest of the chipboard pieces on my layout. I really love the effect created by stamping over the top of chipboard! The wordlet title packs such as the “Remember Wordlet Theme Pack” come as a set of three different chipboard words. I love that they’re just that perfect size for squeezing in anywhere! I tend to leave my title placement until the end of my layouts and more often than not, I leave myself very little room- so these are perfect for that! I felt that the lower right-hand corner of my cluster needed a flourish too! Why not? 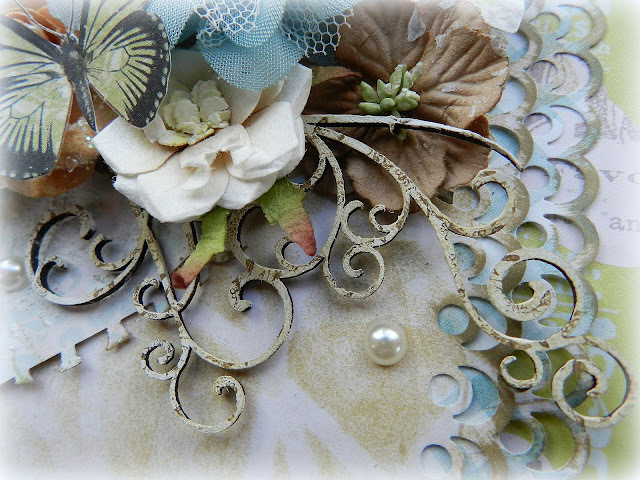 I actually clipped this section from the “Flourish Flower”. And of course my layout would not be complete without some hidden journaling. 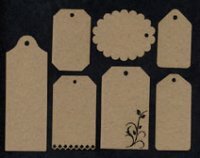 And my go-to supply for that is the many tags available from Scrap FX. This one in particular is from the “Tags, mixed kraft” pack. I simply painted it white with gesso and applied the same techniques as I did the chipboard pieces on my project. Okay! So on to the giveaway!! 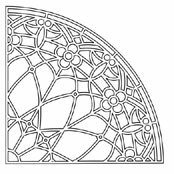 How would you like to win that beautiful Stained Glass Stencil?? Easy! All you have to do is : (1) Make sure you're a follower of my blog, and (2) link up using the Inlinkz tool below! That's it! :) I will keep this giveaway open until midnight of July 13th and draw a winner shortly thereafter. I'm happy to ship to anyone, Internationally! Good luck! Good morning!! 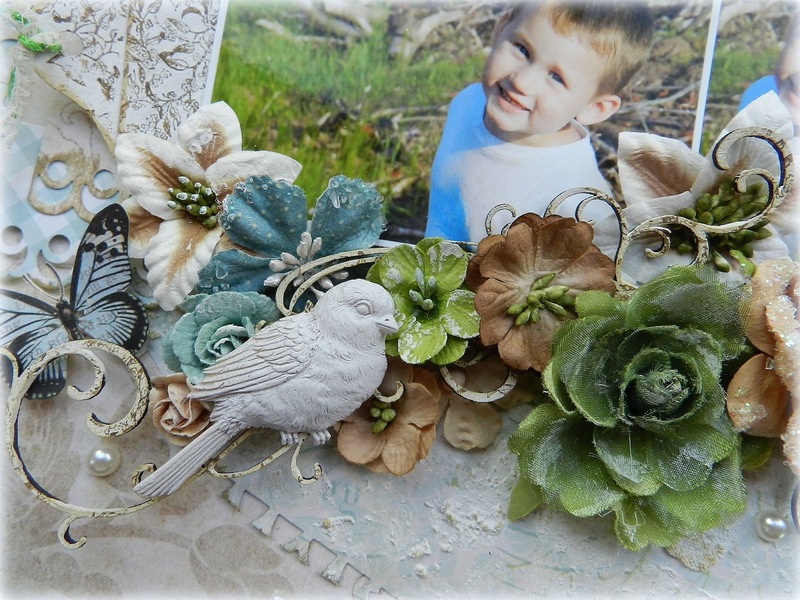 You know I love this one, the layers of background papers and punched edges set such a nice stage for the glorious pile of flowers under you adorable photos of Wyatt...he sure is a handsome boy!! Beautiful layout, Erin! You always have the most amazing details! I love your work! seriously incredible! what amazing details. really gorgeous erin. This is so gorgeous! I am in love with the color palette! Love your layout so much! and the stencil is gorgeous! Simply beautiful! 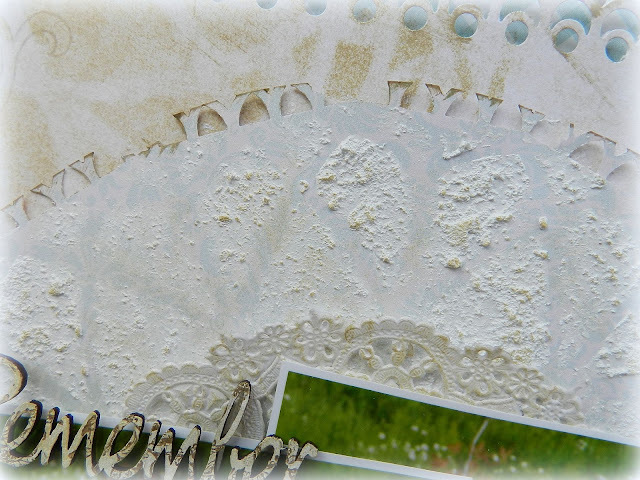 Love how you used the new stencil...looks gorgeous! Beautiful layout and thanks for the chance to win this gorgeous stencil! Beautiful layout. Love all the details. Thanks for the little tutorial. I am planning on trying some masks soon. Love your beautiful LO. You do the most beautiful clustering. Such a pretty layout. Another gorgeous layout! Love all the layering and the flower clusters. Very sweet! Love the stamped chipboard. Beautiful page! 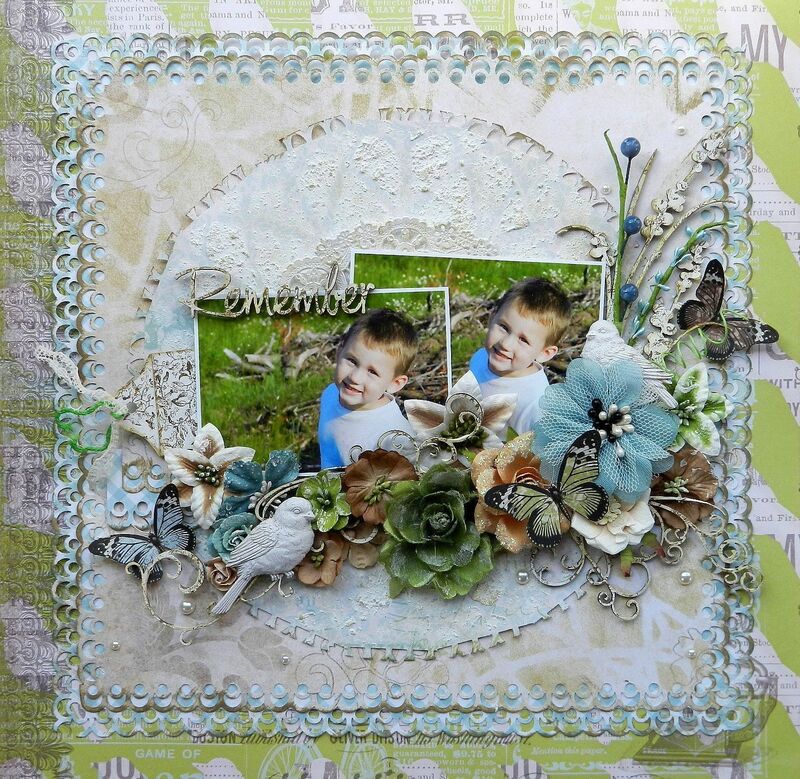 Love your use of the stencil Erin and the flowers and flourishes are a beautiful way to set off your photos!! Gorgeous layout! I love what you did with the chipboard--I need to use it more often, you make it look so easy :) That mask is awesome too, I don't think I've seen one like it. I just became a follower. I am glad I got to see you work in scrapbook.com. Thanks for all the techniques you share. They make me want to try them. So pretty, Erin! I love the outdoorsy feel to this one...the greens & blues are perfect for these pics. The sprigs & twigs are awesome in the mix of all the flowers. Another gorgeous page! Oh my God, Erin! This is absolutely breathtaking!!! All the techniques you used - i am definitely inspired! Thanks so much for sharing and for the chance to win!!! wow Erin, so much dimension and fun accents, love the bird and butteflies, and of course Wyatt is just the cutest!! Wow, your layout is really amazing! Your flower arrangement and use of the stencils is simply breathtaking! this one should definitely be published ... so much gorgeousness to look at ... everything is just perfect. Beautiful LO, I like the way you combined the blue and green. WOW! I really love this LO! your work is so inspiring! thank you! OH! MY! Goodness Erin... I came over to comment on this Stunning Creation & also find you are also having a giveaway.... I'll will try to remember to post this Giveaway on my next blog post!!! (which I need to do a post before the 13th) LOL! Spectacular work Erin!!! I can't stop looking at it. I feel so greedy right now, I want all those chippie pieces! Very cool idea to host this give away! I didn't get this stencil I got the super hero words- perhaps I should try the toothbrush technique texture with those? I love this layout! The clusters are gorgeous and I really like how you finished the berry stem- it's one of my favorite pieces and it looks gorgeous here with the resin birds and Prima flowers. Wow - what a stunning page! I love looking at all the details on your pages - soooo much to see!! Gorgeous!! HI.. What a gorgeous layout.. I love all the close ups photos too as they really show all the details beautifully... really love this!! Wow Erin this is my favourite layout of yours ever! Simply love it!! And that stencil is like WOW amaziiiiiing!! beautiful Layout too!! love the chippies and the flwoer cluster. well love all of it truly! !